The winter has been mild and the wheat has continued to grow and for the fields that were planted a bit early there is more than normal growth. Some of these fields are showing some N deficiency but the plants have enough tillers. So some of the questions are: Do I need to apply N a bit early to take care of the yellowing beginning to show? One does not want to apply N early on these fields and cause them to accelerate their development. This would increase the changes of freeze damage down the road. I think early N would be a mistake under almost any conditions this season. 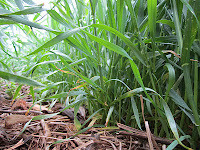 We still have plenty of time to develop some tillers if they are needed. Generally, wheat in these fields have plenty of tillers and plants were a little N deficient. This is right where the crop should be to slow down the development a bit and protect it from some of the very cold temperatures that might be yet to come. At normal green up I would recommend a minimum N to protect the wheat crop from any accelerated development beyond the normal time and put most of the N on at Feekes 6. This recommendation would be especially needed for no-till wheat. Variety or Brand, Are you Buying Different Genetics? There have been some questions about varieties versus brands. Farmers may be purchasing different brands of seed from different companies, but those brands may be the same genetics - - the same variety. There is a difference between "brand" and "variety". You need to know that difference. Cindy Finneseth, formerly with the University of Kentucky Regulatory Services, published the following in Regulatory News, Fourth Quarter of 2010. That article is posted here. Buying and Selling Seed in Kentucky: Varieties vs. Brands "What's in a name? Juliet Capulet may have believed that names are artificial and meaningless, but she was never faced with purchasing seed for planting purposes. To ensure purchasers know the seed being bought, the Kentucky Seed Law requires that seed sold in the state has the name on the tag or label. This name is the variety statement. The University of Kentucky Winter Wheat Meeting is Tuesday, January 10, 2012 at the James E. Bruce Convention Center in Hopkinsville. The meeting begins at 9:00 am until 3:00 pm. Topics include wide-row wheat, variable rate nitrogen, climate affect on wheat, herbicide resistant weeds and others. Lunch is provided by the Kentucky Small Grain Growers Association.